The Micron brush line are affordable mini art brushes for the most detailed work. 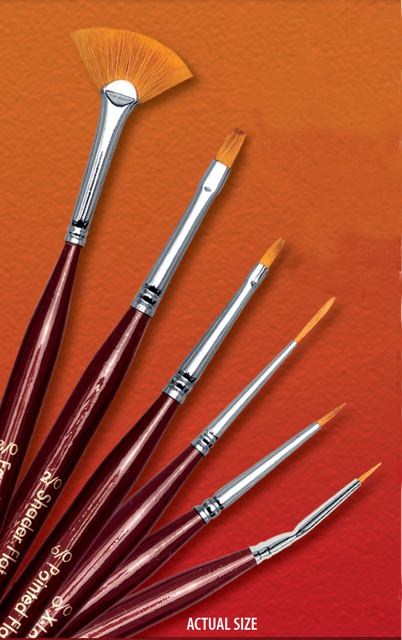 These brushes pack a strong, supple yet tiny tuft into a comfortable handle, ideal for egg tempera work, casein, watercolor or gouache. Would also work quite well for inking drawings or painting eggs. Several importers market versions of these brushes, but not all brushes are created equal…..The Golden Nylon we use in these brushes is carefully tapered, keeping in mind the fact that there is typically a small exposed hair length in these brushes. If the taper is not controlled and blended carefully, you can end up with a brush that “looks good” new… but actually will not hold its shape. These brushes feature a variety of small sizes and types for multiple uses, where a tiny brush is needed. They are made with Nickel plated seamless ferrules. All the brushes use the same size handle, a specially made (made in house) three color lacquered “club” handle. This is a substantial handle, that accommodates a tiny brush head. So although the brush tips are tiny, the handles are not, so they are easy to hold. I have yet to try some microns myself, so if you use them, give me a shout and let me know what you think. To see all the sizes and shapes available, refer to our Micron page on the Dynasty website.